Ecommerce Will Match Organized Physical Retail in India Clocking Rs 83900 Cr In 5yrs. In one of the most comprehensive retail research conducted in India, it has been revealed that Indian ecommerce market will expand to Rs 84,000 crore in the next 5 years, which is a 10 fold increase from current Rs 7200 crore. Thus, by projected market growth, ecommerce will be equal to organized physical retail market in India. The research: ‘Think India. Think Retail.’ has been conducted by US based residential and commercial consultancy firm Knight Frank. As per the report, this incredible growth rate of 64% year on year for ecommerce industry, will be primarily witnessed in India’s top 7 cities: Delhi-NCR, Mumbai, Kolkata, Chennai, Bengaluru, Hyderabad and Pune. The research was primarily conducted to gauge the organized India retail market, which includes both online and physical stores. More than 30,000 retail owners in these top 7 cities were surveyed and the current market dynamics of top ecommerce portals analyzed to derive results. Thus, the report not only analyzed the growth rate of ecommerce, but also studied the downfall of physical stores in the organized retail sector in India. The report cements the fact that physical retail owners are feeling tremendous heat from online retailers/portals, and they need some serious rethinking on their overall strategy. Total retail market in India’s top 7 cities amounts to Rs 3,58,000 crore, out of which organized retail penetration is 19% or Rs 68,000 crore. Out of this 19% organized retail share, physical stores has a market share of 17% whereas ecommerce share is mere 2% or Rs 7200 crore. The report predicts that within next 5 years, the share of Indian ecommerce market will increase from 2% to 11% or Rs 84,000 crore; whereas the share of physical retail will drop from 17% to 13%-11%, thereby making both of these markets equal. It would be for the first time in the history of India that ecommerce will be equal to physical retail. Overall, the total organized retail market (comprising both ecommerce and physical stores) will increase 19% to 24% within the same period, with ecommerce being the major driving force. Surprisingly, as the share of physical retail falls down, real estate builders are increasing modern retail space in the top 7 Indian cities: From the current 70.3 million square feet of retail space, it will increase to 92.1 million square feet, which is an increase of 5.6% year on year. This means that existing physical retail store owners will face more competition: not only from ecommerce but also their peers. The report is certainly quite comprehensive, and detailed as retail trends in every part of these top 7 cities have been analyzed deeply, and data presented covers each and every aspect of the retail business. 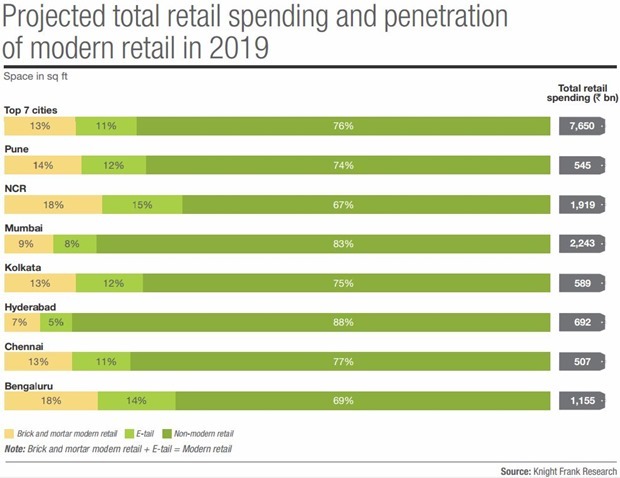 But the threat from ecommerce is looming large on physical retail, and it would be interesting to observe how they react and respond to the threat now. Instead of asking Government to induce ‘entry tax’ on all online goods purchased or protesting against ecommerce portals, physical retail outlets should introduce more ‘hi-tec’ innovations such as smart mirrors, talking mannequins and more. Seriously! This was not expected from firm like Knight Frank. They genuinely need to check their facts while publishing reports like this. Total retail market size of US$60bn for an economy with GDP of US$1.5+ tn? Are you kidding me. They are not 10-15% but 90% off the mark. All their data points are erroneous and far from facts. Publishing such articles/reports can only lead to confusion among readers. I would put part of the balme on author as well for just describing the report in an article without considering the factuality of the numbers.